Seeking the legendary Porsche sport experience, but still require additional passenger capacity without upsizing to an SUV or crossover size? The Porsche Panamera Sport Turismo provides the convenience of a four-door sedan, with the iconic high-octane performance of the Porsche brand. Further improving upon the Porsche performance, the Panamera Sport Turismo features all-wheel drive, to better counteract the oversteering tendency Porsche brand vehicle sometimes experience due to their immense power and light curb weight. 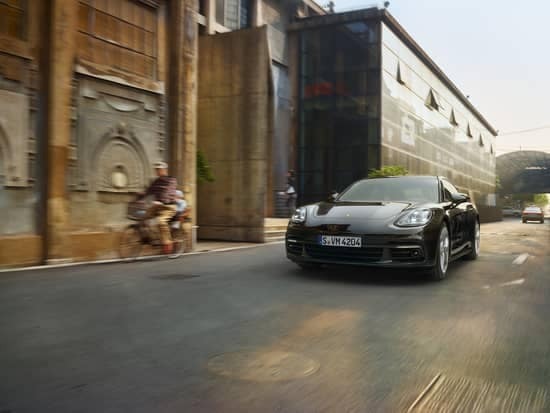 With such advanced systems integrated within the Panamera Sport Turismo, any trim level from this model line will excel everywhere from your daily commute to a day at the track. With innovative features such as available rear wheel steering optional to further amend your selected Porsche Panamera Sport Turismo, the capability and performance of this vehicle exceed all expectations with ease. Come experience the exceptional power, performance capabilities, comfort and advanced technology of the 2018 Porsche Panamera Sport Turismo. At Rusnak/Westlake Porsche we stock an extensive inventory of popular Porsche models, accompanied by exemplary customer service. Stop by our dealership today to learn more about the 2018 Porsche Panamera Sport Turismo, or give us a call to schedule a test drive today!